Spanish language is one of the most important in the world; it is the third most spoken after Chinese and English, because it’s spoken in Spain, Latin America and in some parts of the USA. Spain is a language similar o Portuguese, French and Italian and it is not difficult to learn when compared to Chinese or Japanese. Most people didn’t have to learn other languages beside their native one or English, but times have changed. Today’s businesses cannot ignore the markets that the Spanish language provides. The countries where the people speak Spanish offer a large variety of business and services. Spanish is the official language in 23 countries. About 400 million people speak Spanish in the world. In the USA Spanish has become the second unofficial language. Spanish belongs to the Indo-European family of languages, spoken by a third of the world’s population. There are many more reasons to learn Spanish, but in conclusion this language is important because of its growing number of fans around the world. The proper grammatical formation of the Spanish language it's based being able to write and express his thoughts and ideas upon paper in the right manner. May be acquired in a few lessons using the right tool such as spanish typing test. Being able to type in Spanish is vital when you want to become totally fluent in this language. Mexico is a beautiful country with an amazing culture and amazing monuments. There are many idioms spoken in this multilingual country but its official language is Spanish, other languages include Huastecan, Yucatecan and Chatino-Zapoteca. 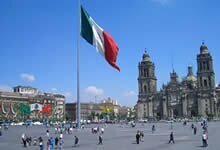 Mexico is mostly visited for its tourist attractions such as Acapulco, Cancun and Guanajuato, which are beautiful cities to enjoy your vacations, without the barrier of language because there are many languages schools offering to learn Spanish in Mexico. There are many online languages services to learn Spanish language, Internet is also the main tool to find information about languages schools in Mexico, while for people who cannot travel abroad to learn Spanish the facility of learning it online is a good advantage, an additional benefit is that by learning the language beforehand allows you to visit any of the Latin America countries and spend more time knowing the culture.